The distance from Earth's surface to its center is about 3,975 miles (6,395 kilometers). Scientists have divided the interior of Earth into various layers, based on their composition. The crust, or outer portion, varies in depth from 5 to 25 miles (8 to 40 kilometers). Below the crust is the mantle, which extends to a depth of about 1,800 miles (2,900 kilometers). 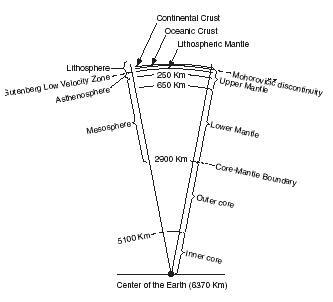 Below that is the core, composed of a liquid outer core about 1,380 miles (2,200 kilometers) in depth, and a solid inner core about 780 miles (1,300 kilometers) deep. From direct observation, core samples, and drilling projects, scientists have been able to study the rock layers near the planet's surface. However, this knowledge is limited. The deepest drill hole, just over 9 miles (15 kilometers) in depth, penetrates only about 0.2 percent of the distance to Earth's center. Geologists collect information about Earth's remote interior from several different sources. Some rocks found at Earth's surface originate deep in Earth's crust and mantle. Meteorites that fall to the planet are also believed to be representative of the rocks of Earth's mantle and core. Meteor fragments presumably came from the interior of shattered extraterrestrial bodies within our solar system. It is likely that the composition of the core of our own planet is very similar to the composition of these extraterrestrial travelers. Another source of information, while more indirect, is perhaps more important. That source is seismic, or earthquake, waves. When an earthquake occurs anywhere on Earth, seismic waves travel outward from the earthquake's center. The speed, motion, and direction of seismic waves changes dramatically as they travel though different mediums (areas called transition zones). Scientists make various assumptions about the composition of Earth's layers through careful analysis of seismic data, a method called subsurface detection. The crust, the thin shell of rock that covers Earth, contains all the mountains, valleys, oceans, and plains that make up the surface of the planet. There are two types of crust: the continental crust (which underlies Earth's continents) and the oceanic crust (which underlies Earth's oceans). The lighter-colored continental crust is thicker—yet lighter in weight—than the darker-colored oceanic crust. The crust is composed largely of minerals containing the elements calcium, aluminum, magnesium, iron, silicon, sodium, potassium, and oxygen. Core-mantle boundary (CMB): Also referred to as the Gutenberg discontinuity, the seismic transition zone separating the mantle from the underlying outer core. Gutenberg low velocity zone: Seismic transition zone between the lithosphere and the underlying asthenosphere. Lithosphere: Rigid uppermost section of Earth's mantle combined with the crust. Mohorovičič discontinuity: Seismic transition zone that marks the transition from the crust to the uppermost section of the mantle. Seismic transition zone: Interval within Earth's interior where seismic waves, or earthquake waves, display a change in speed and shape. Seismic waves: Vibrations in Earth's interior caused by earthquakes. The base of the crust (both the oceanic and continental varieties) is determined by a distinct seismic transition zone called the Mohorovičič discontinuity, commonly referred to as the Moho. First discovered in 1909 by the Croatian geophysicist Andrija Mohorovičič (1857–1936), this boundary marks the point where seismic waves pick up speed as they travel through Earth's interior. Since seismic waves travel faster through denser material, Mohorovičič reasoned that there was an abrupt transition from the rocky material in Earth's crust to denser rocks below. The Moho is a relatively narrow transition zone, estimated to be somewhere between 0.1 to 1.9 miles (0.2 to 3 kilometers) thick. Underlying the crust is the mantle, which is composed mainly of minerals containing magnesium, iron, silicon, and oxygen. The uppermost section of the mantle is a rigid layer. Combined with the overlying solid crust, this section is called the lithosphere, which is derived from the Greek word lithos, meaning "stone." At the base of the lithosphere, a depth of about 40 miles (65 kilometers), there is another distinct seismic transition called the Gutenberg low velocity zone. At this level, all seismic waves appear to be absorbed more strongly than elsewhere within Earth. Scientists interpret this to mean that the layer below the lithosphere is a zone of partially melted material. This "soft" zone is called the asthenosphere, from the Greek word asthenes, meaning "weak." It extends to a depth of about 155 miles (250 kilometers). Gutenberg low velocity zone, the lithosphere is carried "piggyback" on top of the weaker, less rigid asthenosphere, which seems to be in continual motion. This motion creates stress in the rigid rock layers above it, and the slabs or plates of the lithosphere are forced to jostle against each other, much like ice cubes floating in a bowl of swirling water. This motion of the lithospheric plates is known as plate tectonics, and it is responsible for earthquakes, certain types of volcanic activity, and continental drift. At a depth of 1,800 miles (2,900 kilometers) there is another abrupt change in the seismic wave patterns. This level is known as the coremantle boundary (CMB) or the Gutenberg discontinuity. At this level, certain seismic waves disappear completely, an indication that the material below is liquid. Accompanying this change is an abrupt temperature increase of 1,300°F (700°C). This hot, liquid outer core is thought to consist mainly of iron. Electric currents in the outer core's iron-rich fluids are believed to be responsible for Earth's magnetic field. Within Earth's core, at about a depth of 3,200 miles (5,150 kilometers), the remaining seismic waves that passed through the outer liquid core speed up. This indicates that the material in the inner core is solid. The change from liquid to solid in the core is probably due to the immense pressures present at this depth. Based on the composition of meteorite fragments that fell to Earth, scientists believe the inner core to be composed of iron plus a small amount of nickel. This information was very helpful for my project. I found all the things i needed to know about the mantle and also my group members found there information. NICE ARTICLE..I REALLY GATHER LOTS OF INFORMATION...AND THANKS FOR IT...HOPE YOU WILL CONTINUE DOING THIS...WHAT IF YOU WILL ALSO INDICATE THE DISTANCE OF EACH LAYERS FROM IT'S CENTER OR FROM THE SHALL I SAY FROM THE INNER CORE..
thanks this information really helps me a lot!!!!!!!!! i've got a detailed idea about the layers of the earth from this article which shall help me a lot in my exam...thanks!!! I found it quite informative and enriching as it provides evidences as well. this helps a lot but it would be even more helpful if you said the distance from the atmosphere to earth. SCHOOL PROJECTS RULE. THANKS YOUR INFORMATION, I SURPRISED THAT THE INNER PART OF THE OUR EARTH AND ITS TEMPERATURE. I THINK IN FUTURE THAT HOW WE ESCAPE FROM EARTHQUAKE. What a big help! Thank you for sharing your knowledge to us! But I hope you will be able to add the two more layers which are the outer and inner core. But, except from that, you really are a big help! Thank you.